Evenings and nights in Dubai are not less than a festival anyway. From dawn to dusk, Dubai offers a majestic food extravaganza to thousands of eaters every day. Food lovers can really have a blast in this city as it offers them the bounty of eating options ranging from outrageously priced, seven star chef special cuisines to cut-rate buffets and from elite to casual eating, Dubai has just got everything for you. Although all the food in Dubai is delightful, but explicitly, if you been to Dubai, then never forget to try out the grandeur buffets of the town, as this is one the best opportunity to taste an inclusive variety of international and local food relatively at a better price value. Dubai has a great range of buffet restaurants that brings to you Arabic, Middle Eastern, European, Asian and international cuisines. Dubai has a reputation of being slightly exorbitant and thus buffet restaurants are particularly famous among the tourists, visitors and even among the residents. Dubai offers plenty of buffet options where you can find luscious and lip-smacking flavors from all over the world at a reasonable price. There are several buffet restaurants that are all set to please you anytime with their perfectly cooked food delights. Here talk about are the best five restaurants for dinner buffet in Dubai that offer you the paramount food and flavors from. Saffron brings you the most exotic, eclectic and scrumptious flavors of Asia, Europe and beyond. It equally upholds the expertise in regional delicacies particularly in dinner and breakfast. Saffron is among few restaurants of Dubai, which offers live cooking station. And at Saffron your experience is going to be a lifetime; because here you will be surrounded by more than 20 live stations that will be serving you steaming hot directly in your platters. Though dinner buffet menu is huge at Saffron, but lamb chops and beef steaks are out of this world. Saffron is placed in Atlantis – The Palm on Crescent Road – Palm Island – Dubai. Kitchen 6 @ JW Marriott Marquis Hotel is a brilliant choice to enjoy a frilly dinner. This place is just perfect for an evening out with your friends and family. Kitchen 6 features remarkable miscellany of Arabian, Asian and European cuisines. Additionally the beverages, salads and desert sections of the restaurant are also overgenerous. Dinner buffet costs you AED 195 between 7 pm to 11 pm from Wednesday to Sunday. Kitchen 6 @ JW Marriott Marquis Dubai is located on the 1st floor of JW Marriott Marquis Dubai, Business Bay on Sheikh Zayed Road- Dubai. They also offer a hearty breakfast buffet in Dubai as well. Al-Dawaar is a true feast for having an extravagant dinner buffet in Dubai. The place also offers you to enjoy a great panoramic view of the city light and the shoreline. More fascinatingly, it is the only revolving restaurant in Dubai that allow you to enjoy the scenic beauty with its 3600 rotations. Al-Dawaar has a great assortment of European, Arabian, Middle Eastern and international cuisines. Seafood section of Al-Dawaar is especially prominent for its luscious variety of Sushi, Sashimi, Prawns, Shrimps etc. Al-Dawaar is located on the 25th floor of the Hyatt Regency Dubai – Naif. They also offer a delicious seafood buffet in Dubai as well. Latitude is another great options and amazing place for enjoying a dinner buffet in Dubai. The restaurant is full of choices when it comes to Arabian as well as international cuisines. Latitude is an eccentric venue to relish an ostentatious dinner menu in Dubai, as it pleases you with an extraordinary and expounded assortment of delicacies. At Latitude you can find an international style theme buffet with an inclusive variety of main courses, deserts and beverages. Latitude is an idyllic place to enjoy the beautiful sight of shoreline and Burj Al-Arab as the restaurant is located in Jumeirah Beach Hotel on Jumeirah Beach Road – Dubai. Anise has the finest eating menu for breakfast, lunch and dinner. This dinner buffet restaurant offers you a world-class startling miscellany of international cuisines, mouthwatering beverages and lip-smacking deserts. At Anise you can find European, Asian, Arabian, Japanese, French, Italian and Chinese food items in the menu. The delectable deserts of the place are among the unforgettable. Anise is placed on the lobby floor of Intercontinental Dubai Festival City. The restaurant costs you reasonably and serves you great food quality. Anise is usually occupied; thus a prior reservation is recommended. 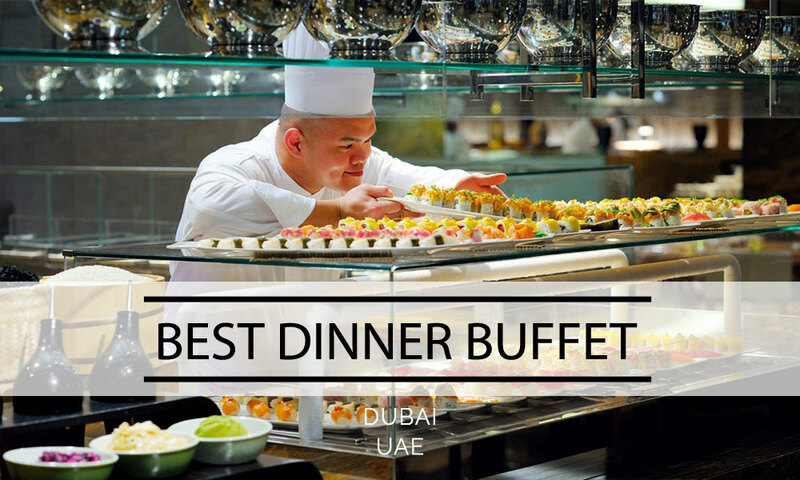 These are some of the best restaurants that offer a quality dinner buffet in Dubai. If you want to recommend a restaurant that offers dinner buffet, please do so by adding comments below.